That's what they used to say at the edges of the map, where the known world became Terra Incognita. I find map edges intriguing - I want to turn the page, find out what is on the other side, see what is just over the horizon. In 1996 I visited Germany, and my favorite memento from that trip is an ADAC Street Atlas (ADAC is the German equivalent of the AAA). It is 211 pages of Germany, starting in the north where the Danish border meets the North Sea, and ending in the southeast, at Berchtesgaden and the Austrian border. Everything in between is depicted at a scale of 1:200,000 (1 cm = 2 km). And not just Germany! 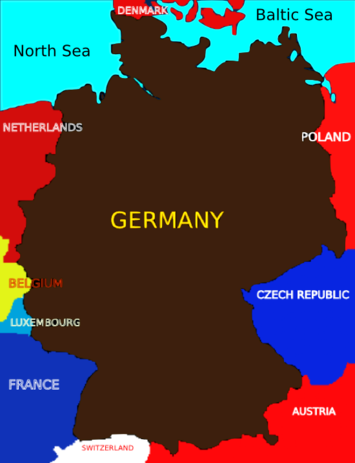 Neighboring countries are shown as well, at least as far as necessary to include all of Germany. Thus it includes a sliver of Denmark, a slice of Poland, chunks o' Czech & Austria, half of Luxemburg, etc. A westernmost salient of Germany juts into the Netherlands to within a few kilometers of Nimjegen. Indeed, for a kilometer or two, the main street (literally: Hauptstrasse) of the German hamlet of Wyler constitutes the border. To the west (in Germany) it is called Nimwegerstrasse (loosely: "on the way to Nim"), and to the east it's titled Oude Kiefsebaan. To include this salient on the map, the ADAC atlas also must include the cities of Nimjegen and Arnhem. But the map does not cover Arnhem's western suburbs. I have no other map of Holland at anything approaching the same scale, so my knowledge of Dutch geography mostly ends at Arnhem. Beyond that, there be dragons! The border with Holland is anything but simple. It twists and turns, includes this farm but not the other, this hamlet but not its neighbor, goes to the center of that canal, but only the west bank of another. It seems irrational, but what it lacks in rationality, it keeps in precision. For the names are all Dutch on one side, but German on the other. I have found only one exception: the Dutch border village of Millingen a.d. Rijn. In Holland, the Rhine River is known as the Waal. Millingen sounds German to me, and it is pointedly not Millingen a.d. Waal. There must be some history there. And yet, something has straightened German borders – and that something likely is war. There is a district in Hamburg named Altona. Altona never sounded German to me, so I asked my folks (who live there) where the name came from. They said it was Danish, and that Denmark used to own much of what is now the German state of Schleswig-Holstein. The border has since moved northward, but unlike the Dutch border it is relatively straight. I don't know the history, but apparently the border has moved back and forth over the centuries, and has now settled on the current truce line at the 55th parallel. Good fences make good neighbors. Of course, since 1945 Germany's eastern frontier has been severely rationalized. The border with Poland is now along the Oder-Neisse line. That line follows the Oder to just south of Frankfurt-Oder. The Oder veers off to the east, but the tributary Neisse goes almost to the border of the Czech Republic. The last few kilometers parallel a road, with said road on the Polish side of the line. Such a boundary has the advantage that it is easily defined, but it also divides communities that were formerly single metro areas. But as everybody on the Polish side is a refugee I guess that doesn't matter. There has been war between Germany and Holland – twice in the last century. So why haven't the Dutch "rationalized" the border in their favor? The Belgians certainly did: the district of St. Vith is Belgium's German-speaking area, and it became part of Belgium after WWI – the fruits of Flanders Fields. But while the Germans have occupied all of the Netherlands, the border has apparently never been disputed. The precision shows – and why fix something if it isn't broken? Good neighbors make good fences? Believe it or not, there is one German border that hasn't seen a war in at least 1000 years: the frontier with Switzerland. And a more embroidered, intricate boundary probably exists no place else on earth (though lines between Indian states must come close). Germany, France and Switzerland meet at Basel in a region known as the Dreiländereck (three-country-corner). The Rhine, which to the north forms the border with France (German place-names on both sides), now veers to the east and "should" form the border with Switzerland. But the city of Basel is on both sides of the river, and there is a salient of Switzerland that looks more like the Caprivi Strip than any rational boundary. Who knows where that comes from? The Swiss canton of Schaffhausen sticks up north of the Rhine like a polyp, only 5 km wide at the base, but widens from there. Indeed, it gets so wide that it ultimately surrounds a bit of Germany – and here my two sources disagree. To drive to the German village of Büsingen am Hochrhein you must drive through Switzerland – ADAC helpfully labels it as a Swiss Customs Area. Yahoo maps show the district as a true exclave – a bit of Germany completely surrounded by Switzerland. The ADAC Atlas, however, is different: to the east of Büsingen am Hochrhein, both banks of the Rhine are shown as Swiss territory, but the river itself is part of Germany. By this reading, the area is not an exclave but is accessible from Germany by boat. I have no idea what the truth is. Let's just say that Paul Bunyan would be flummoxed. And as for those dragons that be west of Arnhem? I've never seen one myself, but I have it on authority that they really are Dutch dragons. Daniel Jelski is Dean of Science & Engineering State University of New York at New Paltz. Submitted by james on Thu, 03/31/2011 - 09:22. I have never been to Germany, but the way you describe that country and it's border neighbors makes me want to go there some day. Such a tour will have to wait one more year though, my family and I already decided to go for one of the carnival cruises this summer and I doubt we will have any other trip this year. Submitted by davebarnes on Sat, 08/15/2009 - 10:17. I just wasted a 1/2-hour of my life with Google Earth. Luckily I came up for air and quit the application. I love nerd article such as this one.